Madrid Airport, or to give it its proper title "Madrid Barajas Airport", has recently completed a huge investment programme which now makes it one of the worlds leaders! Last year over 45 million people passed through its four terminals and with new capacity available due to two new runways this will surely increase. Read this page thoroughly (or even print it) to ensure you enjoy a trouble free visit! Connected to the metro and bus system getting into the city centre via public transport is a cheap and effective option. Terminal 1 - International flights to NON SCHENGEN *countries not operated by Iberia or Oneworld carriers. 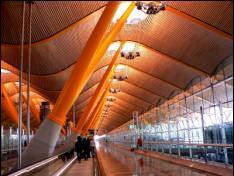 Terminal 3 - Domestic and regional flights not operated by Iberia or Oneworld carriers. Terminal 4 - All Iberia and Oneworld flights. * SCHENGEN is a group of european countries allowing ease of movement without the need for passports. ID must still be carried. Inside each terminal are all the facilities that you would normally associate with a large airport such as banks, money changers, restaurants, duty free (for those eligible), prayer rooms, etc etc..
Whilst these facilities exist they come with typical airport prices!! On arrival to Madrid airport it is possible to use one of the local cash machines to withdraw local currency instead of having to carry cash or travellers cheques. Any Visa or Mastercard works fine. American express owners will have to check with their issuing bank before using their card at Madrid airport if you haven´t used the card abroad to take out cash before. Residents tip: If your travel agent / airline allows it get an E-Ticket or Electronic Ticket which will allow you to check in either via the web or at self service machines. This will save you queuing which in the morning and evening rush hours can be up to 30 minutes. With the ever expanding Madrid almost having completly encircled the airport the transport links to and from the city are excellent. Boarderd on all sides by motorways (highways for our US friends) and conected to the metro / subway / underground system by its own station your options are almost limitless. Metro A fast and modern train takes you to Nuevos Ministerios in under 14 minutes including a stop at the main business / exhibition centre. Located underneath Terminal 2 & in Terminal 4 the station can be reached directly from Terminal1, 2 & 3 just follow the signs "Metro". Using the metro incurs a 1€ supplement for the airport stations in each direction and is payable apart of the standard tickets. To read more about madrids Metro system click here. Bus Depending on which part of Madrid you need to get to the bus may be a faster option for those areas the Metro doesn´t cover. These go from all terminals and cover a variety of districts. There is a special 24 hr Airport bus service for which you will have to pay €2 in each direction however the normal Red buses are at regular rates. To learn more about Madrids bus network click here. Taxi These are lined up outside each arrivals hall and will gladly take you whereveryou need to get to within the city. There is a supplement of just over 4€ for taxis to and from the airport. This supplement will be added to the metered fare. There is no supplement for baggage although some may try to charge you this...DO NOT accept it and ask for an itimised receipt! More on taking taxis in Madrid as well as indicative fares can be found here. Transfer service There are now a number of companies offering private airport transfers at competive prices in their own vehicles. These do not attract the 4€ supplement however you may find yourself losing time looking for your driver in the airport complex. Especially good for large groups of 3 or more people. Madrid Airport offers a number of different shops selling everything from computer games to traditional spanish ham. For some items there are two prices displayed with one refering to the Duty / Tax paid and the other to the Duty / Tax free price. The price you pay depends on your destination for that particular flight. eg if you are travelling direct to the USA you pay the Tax free price. If however you are going via London you pay Tax paid price. This is controlled via your boarding pass which will be requested at payment. Experience has found that other than tabacco and typical Spanish products there are no real savings to be made in the Duty free at Madrid airport. Cuban cigars are on sale in the airport. Residents Tip: Be sure you know the customs regulations for your ultimate destination. For example the USA is unlikely to allow you to take in Meat products, Absinth or Cuban Cigars.